No fewer than 11 people were burnt to death on Sunday in an auto accident at Macmillan area, Soka bus stop, Lagos-Ibadan Expressway, Ibadan. According to eyewitnesses, the accident happened after the propeller of a commercial bus (Mazda) from Ogido in Ogun State broke and hit the fuel tank. An eyewitness, who gave her name as Jelila Adekeye, said, “The vehicle went up in flames in the process. The burning bus also veered off the road. Eight adults and three children were said to have died with 13 passengers, including the driver, sustaining various degrees of injuries. The casualties were rushed to Adeoyo and University College Hospital, Ibadan. The Unit Commander, Federal Road Safety Corps, Oluyole/Toll Gate, Ibadan, Mr. Adeoye Sanya, said, “The FRSC was informed about the accident around 1pm. May d lost souls rest in d bossom of d Lord,amen. Chi very unfortunate 4 them may dare soul rest in peace. I think it high time the Fedral Govt. Scrap FRSC. May the Lord have mercy upon those souls that are lost in that tragic accident. 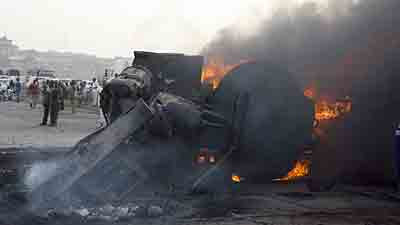 May the souls of those who have died in this fatal road accident rest in peace, am deeply saddened. May dier gentle soul rest in perfect peace nd nt in pieces. Safety, Safety, Safety Violations. It is obvious the bus has poor maintenance record which now resulted in the death of innocent people. The stupid owner’s concern is the money the vehicle would make at the end of the day. Muwa, muwa, bring, bring is all they care about. Majority of the stupid transporters don’t insure their vehicles which means they can’t be held liable for operating poorly maintained vehicles. What a failed a system.